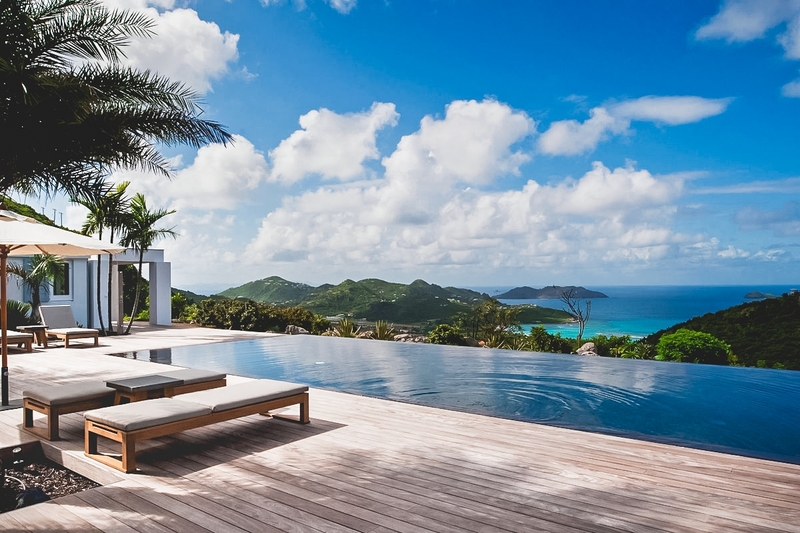 With a unique layout, Olive Villa offers its guests a private hillside escape from which to enjoy all that St. Bart’s has to offer. Four bedrooms are spread throughout separate pavilions that make up the home, along with a fully equipped kitchen, indoor/outdoor dining areas, and a relaxing living room with great water views. Step outside and you’ll find yourself on a spacious pool terrace with an infinity-edge pool that overlooks the surrounding island and the water below. Olive Villa is ideal for couples traveling together, a group of friends, or families with older children. Great view of the island hills and ocean! Olive Villa (OLI) is a new 4-bedroom, 4-bathroom luxury villa built into the hillside of Gouverneur, offering a great view over the island hills, the Bay of St-Jean and the ocean. Upon entering the villa, you’ll notice the spacious and open floor plan, along with the comfortable feel of the home’s atmosphere as it welcomes you in. A teak stairway accesses the central pavilion, which includes the living room, the inside and outside dining areas, and the kitchen. At the left end of the central pavilion, there are two spacious bedrooms, each in separate buildings divided by a walkway. The two other bedrooms are located at the right end of the villa and are also separated by a walkway. All 4 bedrooms are equivalent in size, view, and amenities. There is another walkway along the back of the house which provides a connection to all the rooms in the villa. At either end of the walkway is a small lounging pavilion - for resting, reading, or enjoying a relaxing massage. Just a few minutes drive from Gustavia, St. Jean, and the famous beach of Gouverneur, Olive Villa is the perfect St. Bart’s getaway. Welcome- Minimum age 12 years old, please.